Barcode Verification with ANSI / ISO / CEN standards using AXICON, HHP and PSC Barcode Verifiers. What is Barcode Verification ? Barcode Verification is checking the readability of a barcode. 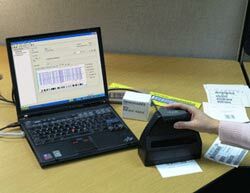 Verification tells us how easy or difficult it will be for a barcode scanner to read a barcode. It is the most accurate way to measure the quality of barcodes. In todays fast and automated world barcodes are of vital importance. Barcodes are the cheapest and one of the most efficient ways of automatic data collection. Verifying a barcode makes it sure that a barcode is introduced in the supply chain system thus avaiding heavy penalties and making sure that your buyer lists you at the top of his list of suppliers.